Esco Tool has introduced an I.D. clamping boiler maintenance tool that can bevel and remove membrane simultaneously without cutting oils and resulting in no heat affect zone (HAZ) to produce superior welds. It is now offered with pneumatic and electric motors which are interchangeable. The Esco Wart MILLHOG® Beveler mounts rigidly to the tube I.D., is self-centering, and provides torque-free operation for clean metal removal without cutting oils and no HAZ (heat affect zone). Esco Tool has introduced an I.D. clamping boiler maintenance tool that can bevel and remove membrane simultaneously without cutting oils and resulting in no heat affect zone (HAZ) to produce superior welds. The Esco Wart MILLHOG® Beveler mounts rigidly to the tube I.D., is self-centering, and provides torque-free operation for clean metal removal without cutting oils and no HAZ. Featuring a robust gear drive with dual tapered roller bearings, this beveling tool has a sealed mandrel to keep debris out and can bevel, face, and remove membrane simultaneously. 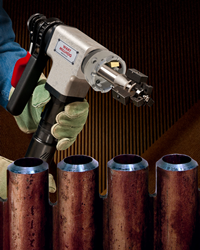 Designed for tube and pipe from 0.75” to 4.5” O.D., the Esco Wart MILLHOG® Beveler is only 2.625” W to fit between tubes for single tube maintenance in a boiler tube waterwall. Equipped with attached clamping and ratchet feed tools, it is available with pneumatic and electric motors and the EscoLock™ blade locking design directs heat away from the tube surface. The Esco Wart MILLHOG® Beveler is priced from $5,995.00 and is available for rent at $195.00 per week.